Chennai Super Kings (CSK) played Rajasthan Royals (RR) in the match no 12 of VIVO Indian Premier League (IPL) 2019 at their home ground M A Chidambaram Stadium. CSK won this match by 8 runs, as RR were unable to chase down the total of 175 posted Chennai. The men in yellow have now won three matches in a row in IPL season 12. 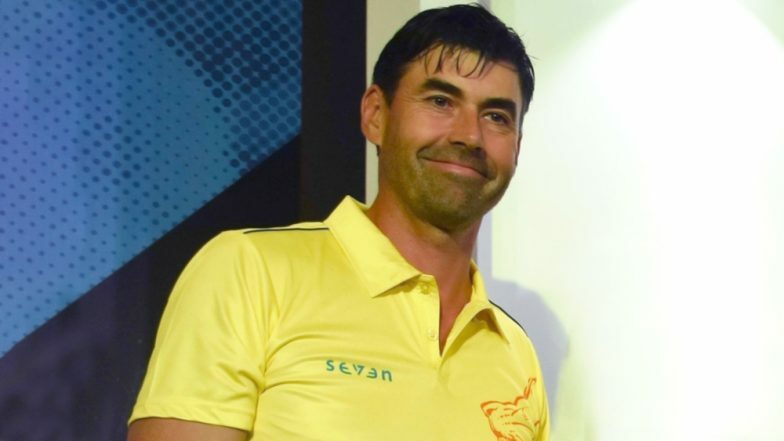 Chennai Super Kings celebrated their coach Stephen Fleming' s birthday after their win against RR last night. CSK vs RR Stat Highlights IPL 2019: MS Dhoni, Bowlers Hand Chennai Super Kings Third Consecutive Win. The former New Zealand captain Fleming was born on April 1, 1973, and has been associated with CSK since IPL Season 1. He played 10 matches for Chennai team in IPL 2008 where he scored 196 runs at an average of 21.77, with the highest score of 45. In the year 2009, he was appointed as CSK coach and retired as a player from Chennai team. Chennai Super King shared the video on social media of MS Dhoni, Dwayne Bravo, Suresh Raina and other CSK players celebrating the birthday of Stephen Fleming. MS Dhoni Hits Masterful 75 During CSK vs RR in IPL 2019 Match at Chennai, Registers 21st Fifty in Indian Premier League. Chennai in their previous match batted first, where they did not have a good powerplay, as they lost three wickets in their first six overs. However, CSK captain MS Dhoni and Suresh Raina bought things under control after that. Raina got dismissed in 14th over after scoring 36 from 32 deliveries while Dhoni played till the end with an unbeaten knock of 75 runs from 46 balls. CSK skipper inning included 4 boundaries and 4 sixes. Yet again CSK all-rounder Dwayne Bravo did it with the ball for his team, where he managed to defend 12 in the last over. Bravo dismissed well Ben Stokes and Jofra Archer in the same over, thereby not allowing Rajasthan to surpass the score of 175. The Carribean all-rounder finished with the figure of 2/32 in 4 overs. MSD was awarded the Man of the Match for his match-winning knock of 75 runs.